Featuring two locations recognised as Areas of Outstanding Natural Beauty - the Wye Valley and Malvern Hills - our two counties forms the perfect landscape for physical activity. The Wye Valley Area of Outstanding Natural Beauty (AONB) was designated in 1971 covering 128 square miles of outstanding countryside south of Herefords downstream to Chepstow on the border of England & Wales, including the ancient forested Wye Gorge. Here are just a few ways that you can get active outdoors and explore the Wye Valley. Stand-up paddle boarding is a great way to watch the world go by whilst enjoying physical activity. Enjoy the beautiful scenery of the Wye Valley, spot the wildfowl that live on the river, and maybe get a glimpse of other wildlife. 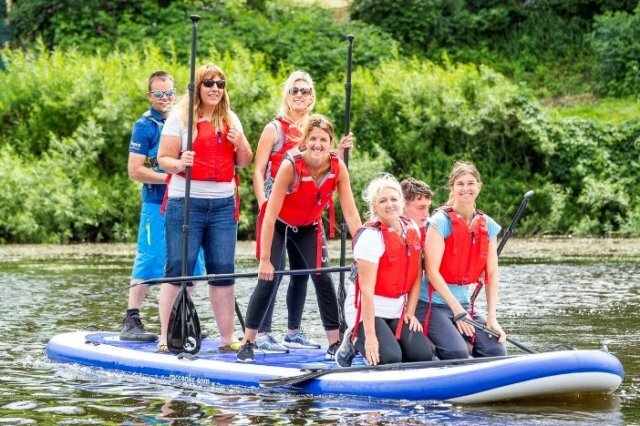 Fancy splashing about on the river and enjoying the picturesque scenery along the River Wye floating past the towering ruins of Goodrich Castle and the stunning cliffs at Symonds Yat? A canoe trip is just the ticket and can include shooting the rapids at Symonds Yat! Terrain: Mainly Traffic Free but some minor roads. The surface is mainly tarmac. Starting in the historic market town of Monmouth - the birth place of Henry V, travelling beside the Wye to Symonds Yat with inviting waterholes for refreshment and refuelling! Travel on a minor road along the last section and on the top of a wooded hill you can marvel at imposing Goodrich Castle, dating from the 11th century with a visitor centre plotting its history right up to its downfall during the English civil war in 1646. Cannons dating back to the Civil War were found here in the 1920s and are on display. Don't forget to download a map of the route. Head for the hillforts and enjoy the 7-mile adventure through time in the great outdoors! If history is your thing then this cracking 7 mile walk will take you through thousands of years of history high above the Wye. Find out about Slippery Jem and the Hyena's Den, the cave where bones of hyena, bison and rhinoceros were found. Pass prehistoric hillforts and cross the river Wye on an ancient hand ferry. The Malvern Hills AONB is famed for its dramatic hills and for the pure spring water that flows from them, but it offers so much more besides. A rich cultural heritage of forts, castles and priories stands proudly from this landscape of ancient woodland, rolling pastures and wild, open commons. The geology of the AONB is varied and fascinating and the area is home to a diversity of locally and nationally important wildlife. Find all the information you need with the visitor map and guide. Unleash your inner explorer! The Malvern Hills AONB is an excellent destination for walkers of all ages and abilities, whether you are interested in a gentle stroll along a tree-lined path or an energetic trek along the ridge of the Malvern Hills. Discovery Walks and Miles Without Stiles guides will take you to some of the best bits of the AONB and provide you with an insight into the natural beauty and variety of interest in the area. On your bike! Cycling is a great way to experience the many sights and sounds of the AONB whilst helping to protect its tranquillity. Enjoy a flatter, easier route around the Malvern Hills with these buggy/wheelchair suitable options. For further assistance, make the most of the new tramper service available at the site.